Best GST Software for Medical Accounting, Billing and Invoice in Agra, India. GST Ready Medical Software for Pharma Retailers, Wholesalers, Chemists and Druggists, Medicine Shops, Ayurvedic Medicine Dealers, Homoeopathy Drug Stores, 24 hour medical shops to maintain their stock accurately, Manage Financial accounts perfectly and generate customer invoices beautifully. Medical Software is intended to streamline the regular tasks of operating a medical store. Medical store software incorporates a wide class of frameworks that deal with the clinical & administrative capacities of healthcare organisations. Medical software helps doctors & medical practitioners access to different records like: billing information, appointment schedules, office reports, prescribing medication and more. Medical Store Management (MEDICA) – revolutionary Software created by Adysoft for managing and automating Medical Stores. It is a one stop Solution provider for the problems faced in the in the field of Medical Store Management. Adysoft brings enhanced software’s to needed customers, with better quality, accuracy and reduced R&D costs. Medica is the complete medical shop management software system is so designed as to ease the work load of medical shopprofessionals. our Medical(Medica Store Software) helps you to examine all the profits, loss, profitable clients and products of medical shop moreover it’s a medical shop accounting software. Flexible and adaptive software suited to medical shops or stores or pharmacies of any size. Medica is today’s Software fully loaded with advanced features to meet all the requirements of Medical Stores in all over Indias. Our Software manage your purchase order automatically, no need to pick copy and pen. It removes your cumbersome schedule and provides an easy & accurate approach. Automatically removes medicine from the stock on their expiries. Can find the alternate medicines according to type, Generics, Formula wise etc.. It shows about the profit & loss of every medicine. Gives details about the medicines storages. Reduces manpower and saves time. 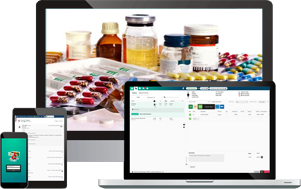 Managing pharmacy business is not as easy but our software for pharmacy shops provide you with the best features which could help you manage different types of prescription, handle drug effectively and dispense software rich with pharmacy rich function. Our Medica is complete GST Ready Software for Medical Accounting, Billing & Invoice in Agra. GST Ready Medical Software for Pharma Retailers, Wholesalers, Chemists and Druggists, Medicine Shops, Ayurvedic Medicine Dealers, Homoeopathy Drug Stores, 24 hour medical shops to maintain their stock accurately, Manage Financial accounts perfectly and generate customer invoices beautifully. Best Medical Software Company in India offering Medical Store Software in Agra. Medical Management Software, Chemist Billing, Pharmacy Accountiing Software in India. Medical Store Software System ?